This year we have started a new to us family tradition with Elf Magic. It started a couple of days ago when Jayden and I sat and wrote a letter to Santa and asked him to send us an elf. Jayden was very excited to write his letter and mail it out. Of course I had to help with some of the letter, but I was so proud that Jayden copied the words Dear Santa, Please and then signed his name. I wrote in the middle send an elf. So when the letter was done we address the envelope and sent it out. Jayden could not wait to meet our new elf. He actually walked in the house and began looking for him. I told him that Santa has to get the letter first to know we want an elf to visit and since we just dropped the letter in the mailbox it would take a day or two. 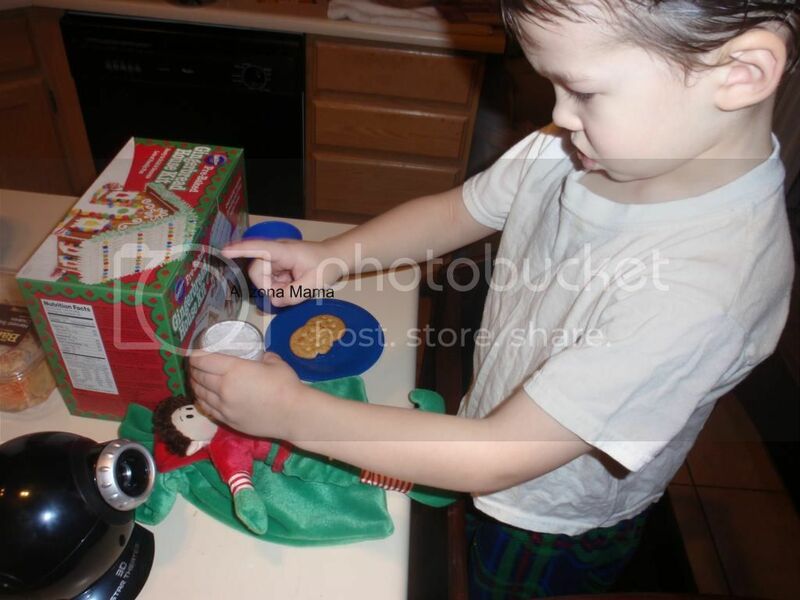 Two days later I walked into the kitchen and there he was.. our visiting elf and he was getting into trouble already. He had gotten into the sugar cookies. I called Jayden to see what I discovered. Jayden was excited to find that Santa did send an elf. We read a note that our elf brought and found out his name is Casey. Jayden let Evan hold Casey for just a few minutes, but then took him back. Jayden said that he didn't want Evan to put Casey in his mouth. Casey has been with us for a couple of days now. Jayden loves him so much. He takes Casey everywhere. Jayden even shared his dinner with Casey and sat with him to watch his favorite shows. The first day Casey was here John ran up to Walgreens to get some of Jayden's allergy medication and Jayden went along and so did Casey. That night we set Casey out with his crackers and glass of ice water (his favorite snack). Jayden opened the magic snow to sprinkle Casey. Jayden hesitated a little as I encouraged him to go ahead and sprinkle some. Jayden looked at me and said, "will he stand up when I sprinkle this?" I had to explain that Casey will not come alive and stand up while he is awake. John explained its like on Toy Story. Jayden completely understood that since he LOVES Toy Story. 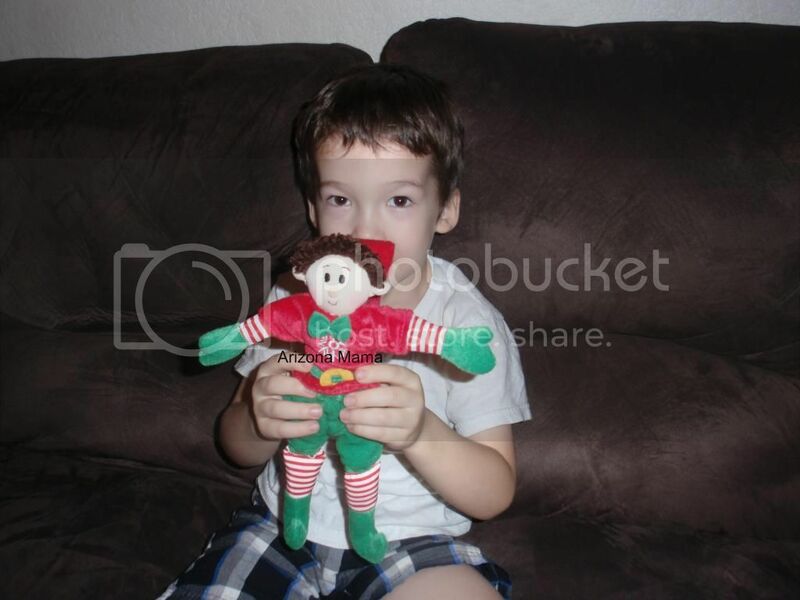 The next morning Jayden woke up and immediately began a search for Casey. He saw that Casey ate his crackers, but he was no longer on the counter. 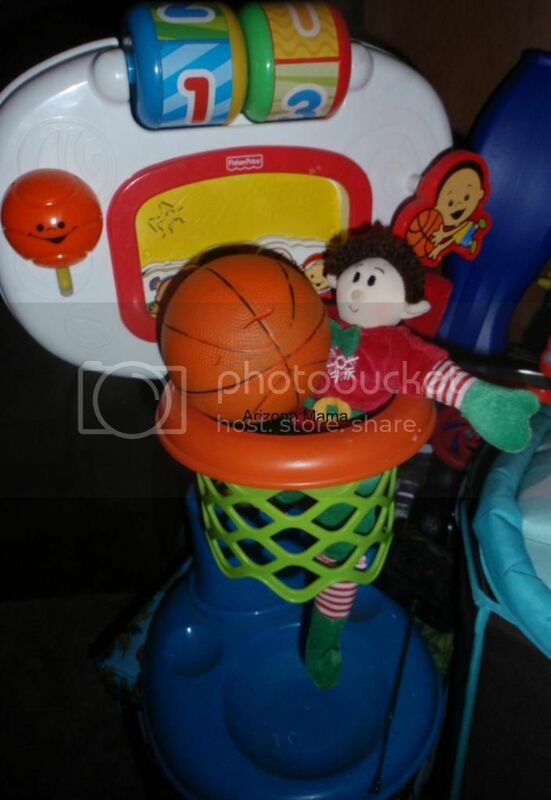 Jayden searched and searched until he found him playing basketball. 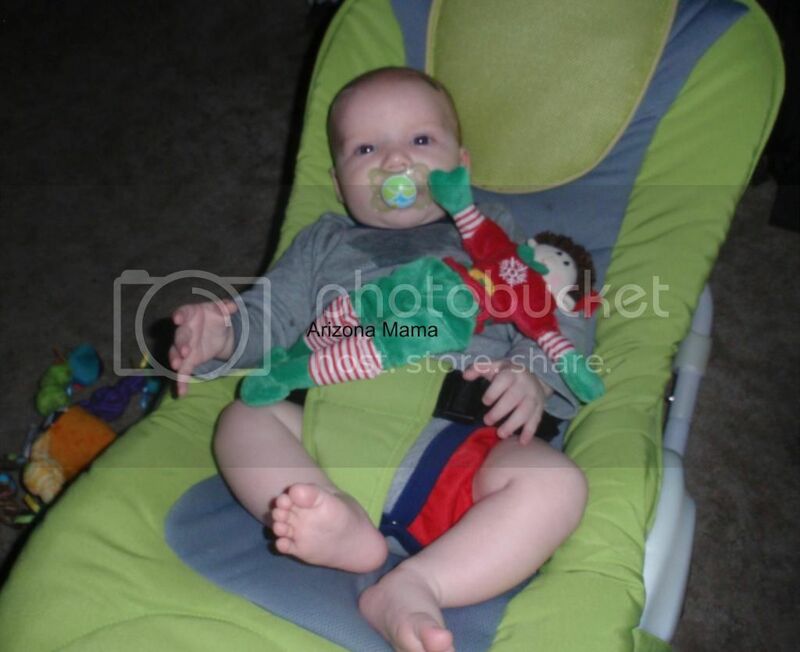 When we left for Nana's house Jayden took Casey along and he spent the day at Nana's with Jayden and Evan. So then last night we again put on the counter with his crackers and ice water. The next morning Jayden woke up and immediately went to the counter again and noticed that Casey had barely eaten any of his crackers this time (opps!). But he was again missing so Jayden went on a search. This time it too much longer to find him. He was hiding really good this time. 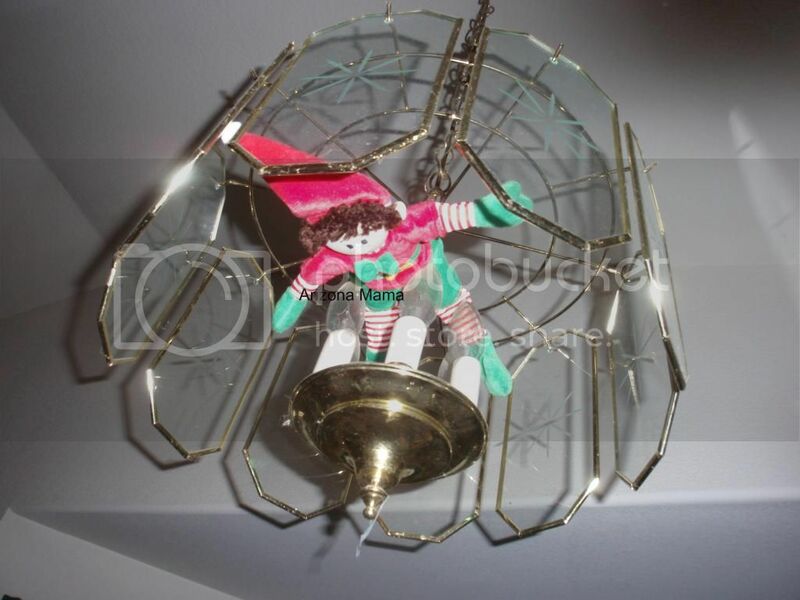 But finally Jayden found him swinging from the kitchen chandelier. Jayden shared his breakfast with Casey since he was hungry after not eating all his crackers the night before. When we left for Nana's house today Jayden accidentally forgot Casey. I was in a hurry since I was running late so Casey was left behind. Jayden was so upset he kept begging me to go back to get him. He was worried about him. I promised that daddy would take good care of him and Casey would be there when he got home. When we got home this evening the first thing Jayden did was find Casey and apologize for leaving him behind. Jayden was very happy to be with Casey again. I am so happy to bring this fun new tradition to our family. Jayden loves having Casey in our home. I'm looking forward to many years of fun elf magic. I just hope that Casey doesn't get into too much mischief during his evening elfcapades. 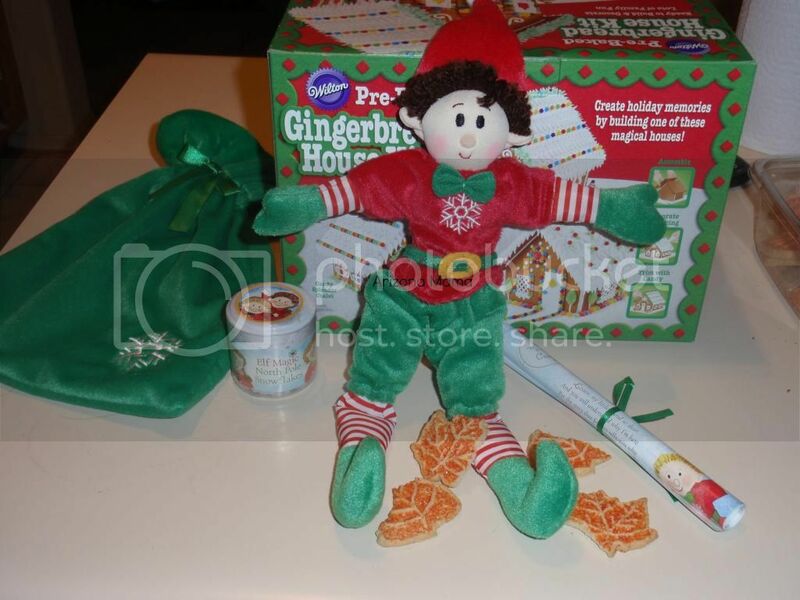 I will be sure to update you on some of Casey's fun elfcapades so watch for upcoming posts and facebook updates. i love this tradition! i saw it in a magazine! it is so fun! 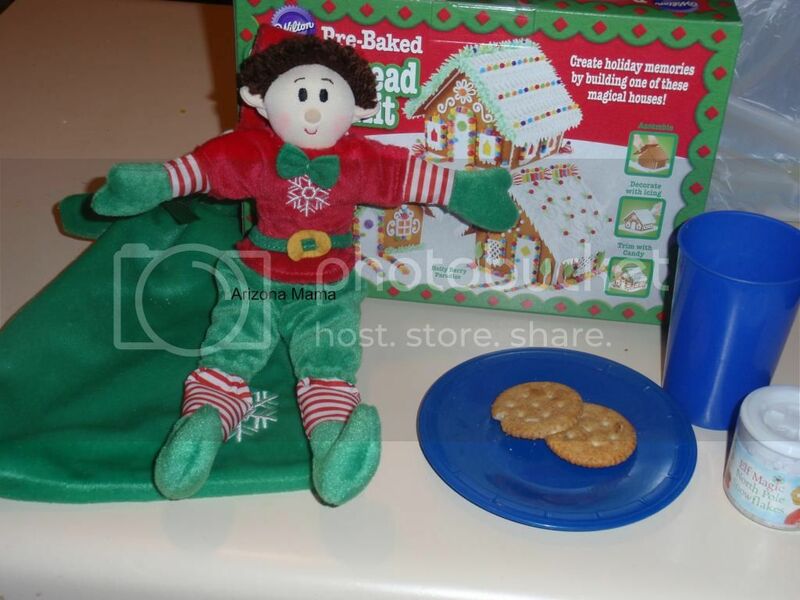 We do the elf on a shelf in our home and have had so much fun with it... I guess I need to locate him now. FUN!! We just started Christopher Pop-In-Kins today! :) I hope you have fun with your little Elf!